This desk hutch is a great addition to your bedroom desk. For high quality and easy display this piece has 4 small shelf compartments for storage the surround one large center shelf. The bottom of the shelf is tall enough so the desk can have a computer screen on it without the hutch being in the way. 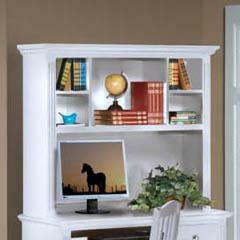 Use the hutch to store books, magazines, toys, and other room display items. The Victoria Desk Hutch by New Classic at Michael's Furniture Warehouse in the San Fernando & Los Angeles area. Product availability may vary. Contact us for the most current availability on this product.